A long overdue update to My Big List of Strange and Wonderful Words. See? I’m still learning stuff. pettitoes (PETT-ee-tohz) — noun: pig’s trotters, especially when used as food. Cute word, right? Can’t you just picture Babe flitting across Hogget’s farm on pettitoes to the sound of a trilling xylophone? You can? Great. 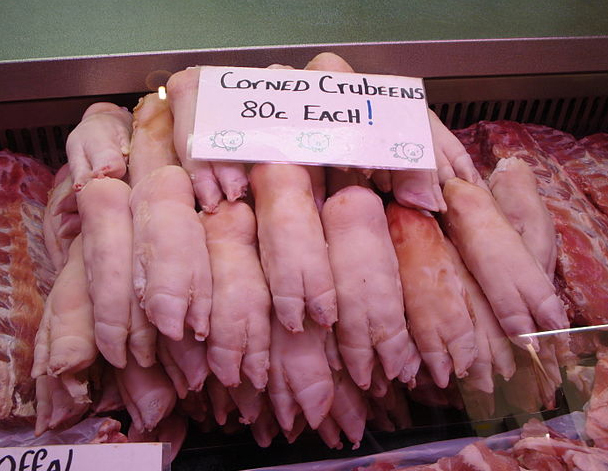 Now imagine those porcine tootsies lopped off and sent to a butcher’s case. That’s where pigs’ feet go to await some hungry hausfrau hoping to use them to make stock or gravy. Just looking at the word pettitoes, you might think the etymology is obvious, what with petty coming from the French petit, “small,” and being used in English to mean essentially a derogatory version of the same thing. But it’s that second part, toes, that’s surprising. The word comes to English from the French term petit oie, meaning “little goose” and referring to that bird’s giblets. Apparently the term jumped from giblets to all manner of offal and then finally to pigs’ feet. I haven’t seen it stated specifically, but I assume the change in spelling and definition resulted from English speakers hearing the word and assuming it meant what it sounded like. At least one etymology book, however, simply sites that the word always referred to feet, but I’m willing to guess that the majority of sites offering the goose-to-pig switch have it correct. One more bit on the French word ire, meaning “goose.” It’s related to Italian word for for the bird, oca, whose diminutive form is ocarina. The instrument — which nowadays is unknown to all but Legend of Zelda fans — is so named because its shape was thought to resemble that of a goose. Now you can tell your ocarina band all about this and sound extra cool. See previous strange and wonderful words after the jump.